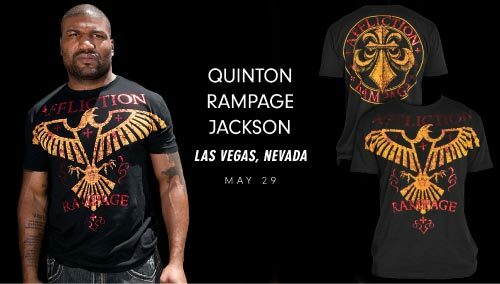 Rampage Jackson’s walkout T shirt for UFC 114 is his very own Affliction Signature T shirt. He will sport this shirt when he finally faces off with long time rival Rashad Evans in the main event. It features a black color and gold color scheme. (Also available is a Blue and white shirt). 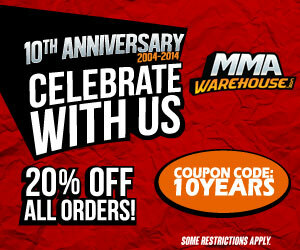 These shirts are the similar to the Affliction crest shirts for George St. Pierre. Also on the front, is as imposing eagle icon with a unique color that is a pattern stylized print. The back has a huge “Rampage Affliction” brand, it definitely stands out just like the fighter himself. The Rampage Shirt has been fabricated into a slim fit form for a more stylish piece of MMA clothing.